One-pot meals are the savior of weeknight cooking, and this pasta is one of my go-tos. 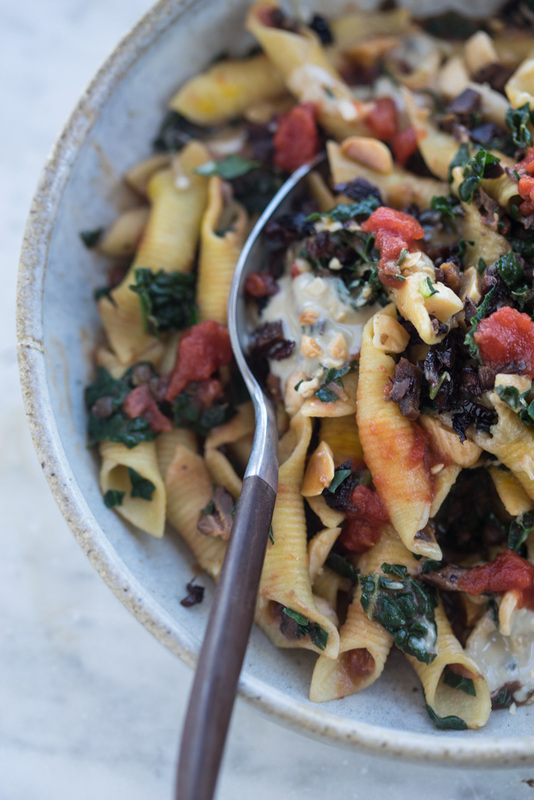 It's pasta and lentils simmered in crushed tomatoes, finished with lots of chopped kale, saffron, swirls of tahini and chopped almonds. I made a video of how it comes together, but the gist is to simply place most of the ingredients into a big pan or skillet with boiling water, simmer down until the pasta is tender, and plate in shallow bowls with your favorite toppings (I include a list of suggestions). Variations couldn't be easier once you get the hang of the technique. The recipe is included here, and you can also see how I pull it together in the video. As I mention in it, you can easily do a vegan version of this, or use whatever gluten-free pasta you like. I think the reason I always come back to this recipe is because you've got greens, protein from the lentils, and a range of whole healthful ingredients all in one pan. It's a total crowd-pleaser, and leftovers are A+ as well. Place the pasta, tomatoes, olive oil, lemon zest, garlic, and salt into a large, deep skillet or saucepan. Pour 4 cups of boiling water over the tomato mixture, cover, and bring to a boil. Uncover, and simmer until the pasta is just al dente, depending on the pasta this typically takes 6-10 minutes, stirring regularly. Once the pasta is al dente, stir in the lentils, and then the kale, allowing it to collapse. Finish with the saffron. Allow the pasta to finish cooking, and much of the liquid to be absorbed, another minute or so. Serve topped with any toppings you like in a shallow bowl - dollops of tahini, chopped almonds and olives are pictured here.